Had to post a funny comic from the paper today! Now here is a scary new Giant PEZ that is reported to have just hit Toys R Us : BARBIE. 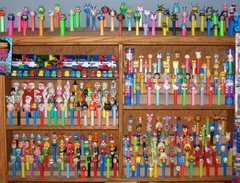 I think this is a PEZ first - with HAIR. 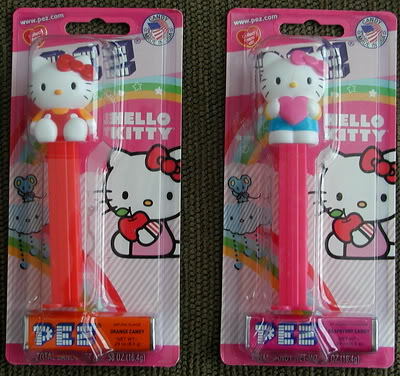 Sightings have been reported for new HELLO KITTY - full body PEZ. It seems there can't be enough of this figure. If you are really into PEZ news click the Candy Industry logo below. It will take you to an article that covers 2010 & 2011. 2011 anticipations include SUPERMAN, CAPTAIN AMERICA, and LORD OF THE RINGS and more...! Sarah got an EASTER BUNNY PEZ in her Easter basket... the 2010 Choco Bunny with buck teeth and white whiskers.